Toro lawn mower company was founded in 1914. The current headquarters are located in Bloomington, Minnesota. For many decades, the Toro company has provided a solid product for homeowners and commercial customers alike. The fact this company has thrived for almost 100 years is strong testimony to the quality of these machines! Toro began manufacturing lawn tractors early in the company’s history. The Toro company acquired the Wheel Horse brand in the 1980’s, which further expanded the product line. For several years a hybrid brand was marketed ( Toro - Wheel Horse), but the current models feature only the Toro name. Wheel Horse does not exist as a separate brand at this time. All the Toro lawn tractors feature the ‘3 in 1’ option,allowing for side discharge, mulch,or rear bagging. The deck cutting height is adjusted manually using a lever. The front axles on all Toro tractors is fabricated of cast iron. This is the sturdiest material available for a lawn tractor front axle. The deck design on all the Toro lawn tractors feature the ‘step through’ design. This eliminates any obstructions in front of the drivers seat. This allows for easy entry and exit from the tractor without the need to lift feet and legs over a raised portion of the frame. Toro lawn tractors are available in 2 model series - the LX (lawn tractor) and the GT (garden tractor). The GT models are more expensive, and are equipped with larger engines and heavy duty transmissions. There are 3 LX models available, and two models in the GT series. The LX series offers a choice between a single cylinder Kohler Courage engine, or a Kohler twin cylinder engine. Horsepower ranges from 19 HP ( single cylinder) to 22 HP (twin cylinder). Both versions of the engine feature a pressurized oil system, with a replaceable oil filter. The two lower priced models ( LX423 and LX427) have a manual PTO used to engage the cutting blades. Both have a 2 blade 42” cutting deck. Model LX468 comes with an electric PTO, and a 3 blade 46” cutting deck. .
Count on spending between $1700.00 to $2200.00 for the tractors in the LX series. The 2 higher priced machines built by Toro include models GT2100 and GT2200. The GT2100 is equipped with Kohler Courage OHV (overhead valve) 23 HP engine. A heavy duty automatic transmission ( not hydrostatic) comes standard on the GT2100. The GT2200 has the more powerful 25 HP Kohler OHV engine. The transmission is a heavy duty hydrostatic type. Both GT versions come with a 3 blade 50” cutting deck, activated by an electric PTO. Count on spending between $2500.00 to $2900.00 for the tractors in the GT series. 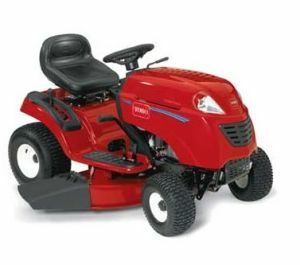 Most customers that purchase a Toro lawn tractor buy another in the future, based on high satisfaction.